Telluride, CO – The Colorado Flights Alliance, formerly the Telluride-Montrose Regional Air Organization, has once again brought direct air service into Telluride Regional Airport (TEX) from Denver (DEN). Two years after pulling out of Telluride, citing pilot and crew shortages, Denver-based regional carrier Great Lakes Airlines will average 10 flights per week year-round into Telluride beginning December 17. Colorado Flights also partners with United, Delta, American and Allegiant airlines on non-stop winter service to the Montrose Regional Airport, an hour and a half drive from Telluride, from Chicago, Newark, Atlanta, Houston, Dallas, Phoenix and Los Angeles. Flights on Great Lakes will operate year-round with two or more daily flights during busier times of the year and one flight daily during slower periods. Great Lakes also will continue its relationship with United Airlines, allowing travelers to leverage United’s network and book directly through United.com. Great Lakes will fly the route with its 19-seat Beechcraft 1900 twin-engine turboprop planes that specialize in airports with short runways. 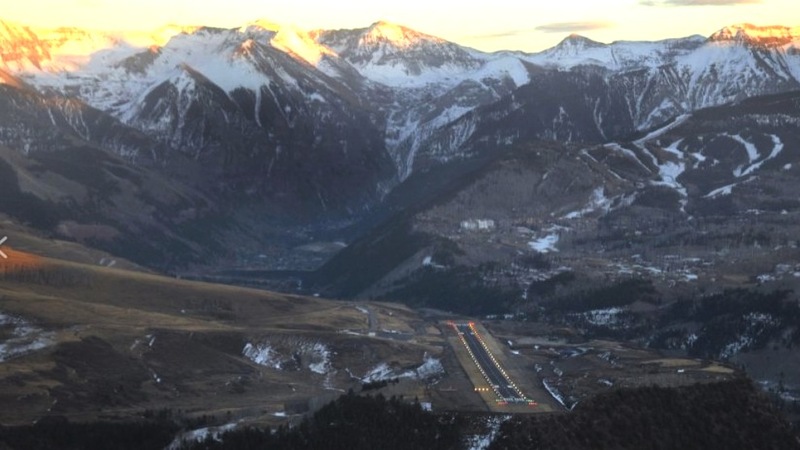 That’s a good thing as Telluride Regional is the nation’s highest commercial airport at over 9,000 feet, and its 7,111-foot runway is one of the nation’s most spectacular. It sits 1,000 feet above the San Miguel River Valley atop Deep Creek Mesa near the ski resort, surrounded by 14,000-foot peaks with cliffs dropping away from either end of the runway. Fortunately for pilots and passengers alike, the runway’s infamous “dip” has recently been removed.